Kheirollah, A., Aberomand, M., Nikzemir, A., Malekasgar, A., Alimohammadi, M. (2013). The Inhibitory Effect of KCN, NaN3 and some Bivalent Ions on Lipoxygenase Activity of the Purified Human Placental. Iranian Journal of Pharmaceutical Sciences, 9(1), 39-45. Alireza Kheirollah; Mohammad Aberomand; Abdolrahim Nikzemir; Ali Mohammad Malekasgar; Mohammad Alimohammadi. "The Inhibitory Effect of KCN, NaN3 and some Bivalent Ions on Lipoxygenase Activity of the Purified Human Placental". 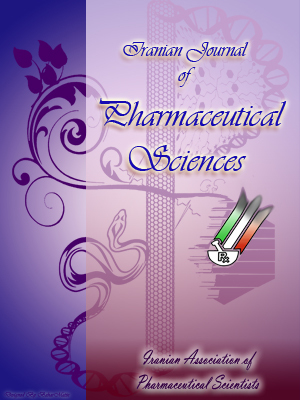 Iranian Journal of Pharmaceutical Sciences, 9, 1, 2013, 39-45. Kheirollah, A., Aberomand, M., Nikzemir, A., Malekasgar, A., Alimohammadi, M. (2013). 'The Inhibitory Effect of KCN, NaN3 and some Bivalent Ions on Lipoxygenase Activity of the Purified Human Placental', Iranian Journal of Pharmaceutical Sciences, 9(1), pp. 39-45. Kheirollah, A., Aberomand, M., Nikzemir, A., Malekasgar, A., Alimohammadi, M. The Inhibitory Effect of KCN, NaN3 and some Bivalent Ions on Lipoxygenase Activity of the Purified Human Placental. Iranian Journal of Pharmaceutical Sciences, 2013; 9(1): 39-45. 1Department of Biochemistry, Medical School, Ahvaz Jundishapur University of Medical Sciences, Cellular and Molecular Research Center, Ahvaz Jundishapur University of Medical Sciences, Ahvaz, Iran. 2Research Center of Physiology, Ahvaz Jundishapur University of Medical Sciences. 3Department of Biochemistry, Medical School, Ahvaz Jundishapur University of Medical Sciences. 4Biotechnology and Bioscience Research Center, Qom University of Medical Science, Qom, Iran. Lipoxygenase(LOX) catalyzes irreversible transfer of oxygen molecule to Arachidonic and Linoleic acid to produce 13 Hydroproxy Octadecadienoic acid. Recent studies showed the involvement of Lipoxygenase products, leukotrienes, in inflammations and Lipoxygenase pathways acts as mediators of early inflammatory events in atherosclerosis. The aim of the present study was purification and characterization of Lipoxigenase from Human placental. The human placental Lipoxigenase was extracted and purified by normal butanol, acetone, ammonium sulphate (30-80%), and gel permeation chromatography on Sephadex G-150. After purification and characterization of LOX, the in vitro inhibitory effect of KCN, NaN3 and some selected bivalent ions such as Co2+, Ni2+, Cu2+, and Zn2+ was checked on the activity of purified LOX. Results showed that specific activity was 123.16 u/mg proteins and the yield of purification was 21.84 percent. Also, it was found that Co2+, Ni2+, KCN, and NaN3 at concentration of 20 mM had inhibitory effect on LOX activity and their inhibitory was 72.4, 58.2, 56.5 and 42.3% respectively, however Cu2+ stimulated the lipoxygenase activity at the same concentration whereas Zn2+ has no significant effect on LOX activity. With respect to increase of LOX activity in the patient with cardiovascular diseases, Alzheimer's disease, cancer, chronic obstructive pulmonary disease (COPD), artherogenesis, and also airway inflammation diseases, suggesting that LOX inhibition may have beneficial effects as a potential target to limit the severity of related symptoms of these diseases and therefore these inhibitors could be considered as an agent for decreasing the enzyme activity in association with the disease.